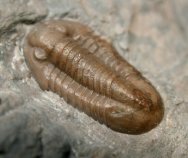 The Proetids persisted the longest and were the last order of the trilobites to go extinct. 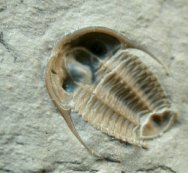 These last survivors arose in the Ordovician and died out during the great Permian Extinction. 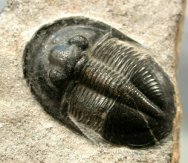 * Different taxonomies are found, most recently with trilobites contained in Superclass Arachnomorpha in Subphylum Schizoramia. have the more common holochroal eyes. Holochroal eyes closely packed biconvex lenses beneath a single corneal layer covering all lenses. Each lens is roughly hexagonal and thus in direct contact with adjacent ones, and can number into the thousands of lenses. 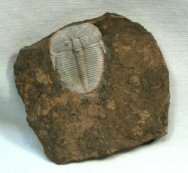 The proetid's thorax of proetids have between some eight to 22 segments. 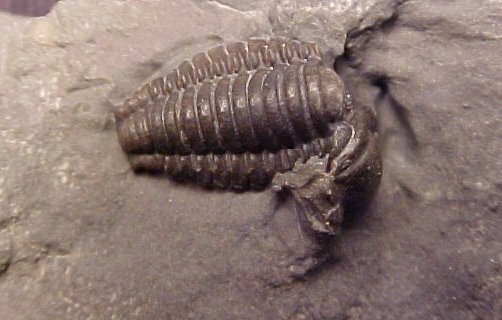 Many have pronounced genal spines resembling those of trilobite order Phacopida. Proetida (pronounced Pro-eh-tee-da) is often included in subclass Librostoma along with what are now Orders Ptychopariida, Asaphida, and Harpetida that were united as Order Ptychopariida, a huge and paraphyletic group (see the 1959 Treatise on Invertebrate Paleontology). The subclass Librostoma was erected in 1990 by Fortey (1990) to encompass these orders that share a natant hypostomal condition. Subsequently, Ebach & McNamara (2002) erected order Harpetida because its members lack a rostral plate and have a marginal facial suture.